In the days following my return from this trip I knew something had changed, I was uneasy and troubled. Then one night I had a vision. 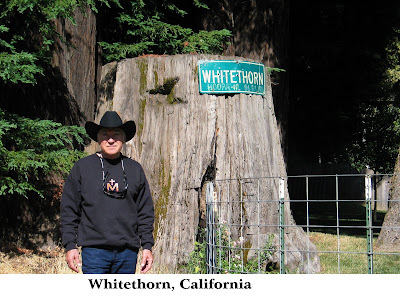 I was standing in the middle of a redwood forest when suddenly the earth shook and the sky turned a bright white, there was a roar of thunder and an intense shaft of orange light flashed from above and entered my body. And for the first time in my life as a painter I understood the true meaning of art as a religion. I realized that for all my preaching about art as a religion I did not understand its true meaning and that I was not leading the life of a true religious. I took a hard look at my life as a painter and realized I had lost my way. I had started out strong but because of what I had conceived as limited "success" I become complacent and undisciplined. So I set out to remedy the situation. I began by digging out all my old journals and writings that I had done over the past forty-five years. To my surprise I found within those writings many things of such a profound nature I scarcely believed I had written them myself. I virtually knew not what I had written until now, now that I had a new understanding of what art as a religion really meant. The readings continue as of this writing. I am now planning a second season of readings that should start in October, 2009. I continue to study about monasteries and the monastic life, particularly about the Shoaling monasteries in China and the Shinto monasteries in Japan. Thomas Merton, (1915-1968) was born in France, the son of Owen Merton, (1887-1931) a British landscape painter. In 1941 he became a Trappist Monk at the Abby of Our Lady of Gethsemani, in the state of Kentucky here in the U.S. 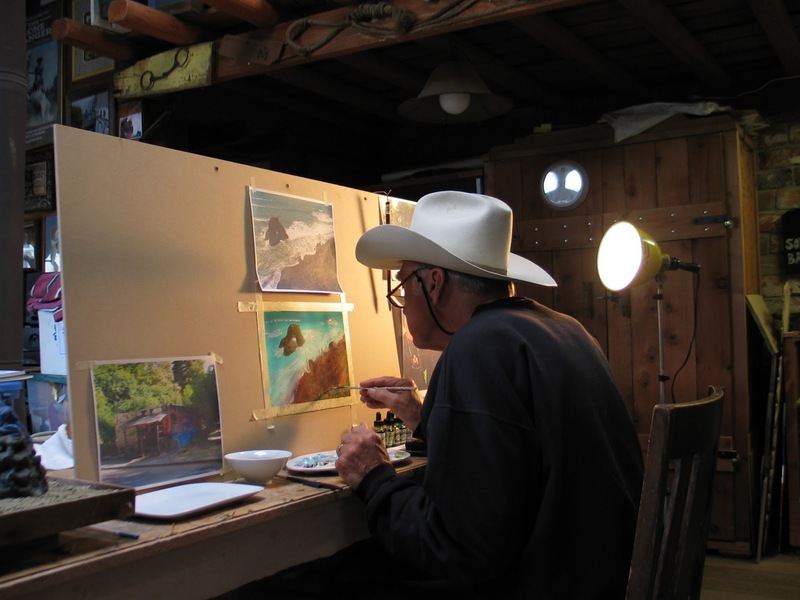 Although Owen Merton's paintings are still being exhibited and sold today, his son’s reputation as an artist has far outstripped his father's. Thomas Merton was a prolific writer and gained international recognition as an author and poet, writing more than 60 books and many essays. He also tried his hand at photography and made some attempt to do Zen brush painting. His most famous book, "The Seven Story Mountain," is a biography written while he was living at the monastery in Kentucky and is considered a religious classic. In his later years Thomas Merton began to study Zen Buddhism to see what relationship or connection it might have with Catholic monastic life. He became friends with D. T. Suzuki and the Dalai Lama and wrote several books on Catholicism and Zen and the search for a deeper understanding of the inner self. The fact that he understood the life of an artist through his father, and was himself an artist, makes me think perhaps he was trying to integrate the two disciplines to better understand the inner workings of an artist. He didn’t say as much because he was, at the core, a God believing religious monk, not an artist. But he did say, “The integrity of an artist lifts a man above the level of the world without delivering him from it.” In essence, an artist’s head may be in the clouds but his feet are still planted on the ground. It is that inner conflict of opposing forces that constantly torments an artist, and I think in some way he may have been trying to define and resolve that issue. I have read many of his books, picking my way through his Catholic God believing passages, dodging his religious dogma, trying to mine his seven story mountain for small nuggets of insight into the nature and spirituality of art from a contemplative's point of view. However, it must be understood that I feel a spiritual kinship with Thomas Merton the artist, not Thomas Merton the Catholic God believer, - for I, like Picasso, am a non-believer. 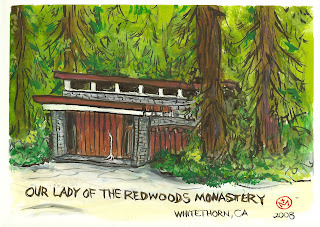 With that in mind, I am going to briefly follow Thomas Merton the artist as he worked with his camera in Northern California taking photographs in and around Our Lady of the Redwoods monastery at Whitethorn. I hope to find some of the locations where he aimed his camera. 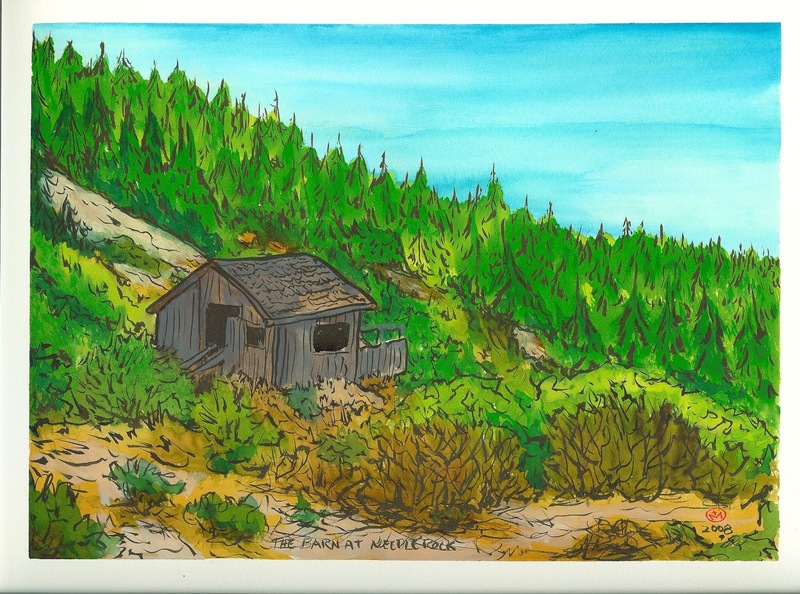 I want to try and paint some of the same scenes from the exact spot if possible. 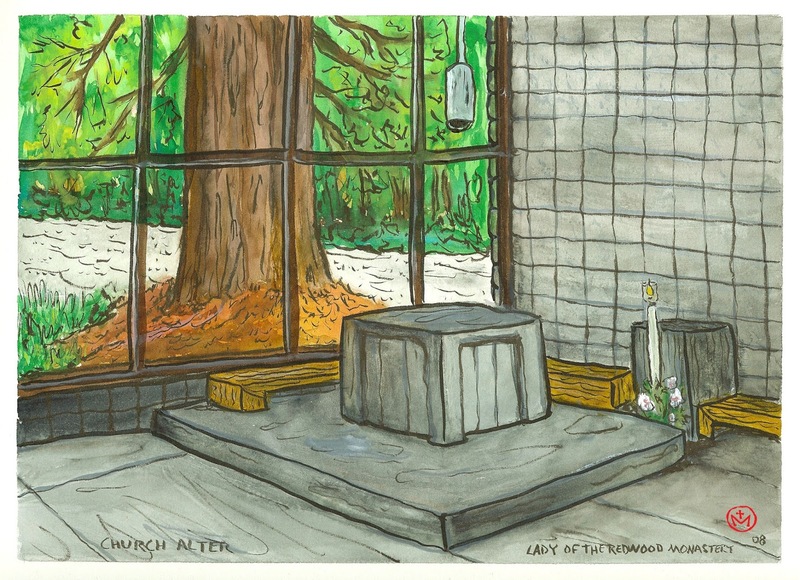 In this way perhaps I will connect with the spirit that was Thomas Merton the artist. 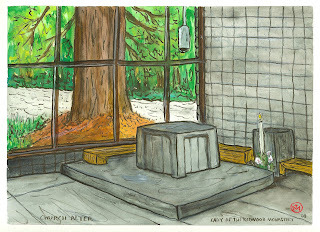 Someday I hope to find a clear connection between Zen, religion and art. Joining me on this pilgrimage will be my wife Alice, who, as always, guides my physical being through all the obstacles that are the roads, towns, motels, restaurants, and things to numerous to mention, to our destination. Joining us also will be our cousin from Detroit, Doug Locke. In the film, "Touch the Sound," buried in the "extras" is a short piece of film of Evelyn Glennie visiting a Bow maker (as in bow and arrow) in Japan. To the Japanese shooting a bow and arrow is a ritual, not a sport. It is an art form rather than a feat of skill. The bowman dresses in ritual garb, he uses a handmade bamboo bow with handmade arrows. The object is not to hit the target perfectly, the target is only there to stop the arrow. The object is to contemplate the artistry and beauty of the weapons, to show strength, steadiness, calm, firmness in the archer. When a Japanese archer draws his bow all eyes are on the archer, - where the arrow lands in the target is of secondary importance. In America just the opposite is true. For Americans the target is the only thing. To hit the center of the target is the absolute goal of all American archers. Their bows are manufactured out of aluminum, titanium, whatever metal works best, They have recurve bows, compound bows, bows with counter weights, sights, and they use aluminum arrows, all made in factories by machines. Because the object is to hit the center of the target, no one watches the archer, they only watch the target so that a winner or loser can be determined. America is grounded in winning. Winning is the only thing Americans think about. Winners are everything, losers are nothing. In American art the same dynamic is in play. Those artists who sell for the highest prices, are praised by the critics, are shown in the top museums; they are the “Art” winners. All the rest are non-artists, - they are just losers trying to make art. Also in America all emphases is placed on the paintings, like the American archer's emphases is on hitting the target. However, for me the emphasis is on the act of painting. Like the Japanese archer I concentrate on being an artist, not on the painting produced. For me my paintings are like the Japanese archer's target,- just something to catch the paint. My approach to painting requires me to be prepared both mentally and physically. To help with this, much of the material I use, like the Japanese bowmen‘s weapons, is handmade. For me the process of painting starts with the design and development of the means. For this project I hand carved a brush out of oak, adding a cross symbol. It rests in a branded redwood case. The boots I am wearing, the “Spirit” boots, I also made by hand. On the right boot is the Chinese character for “Spirit.” On the left boot is the Native American Indian symbol for “Great Spirit Everywhere.” The sole of each boot has been branded with my spiritual symbol, the cross over M. Wherever I walk I will leave a “spiritual” trail. The rest of my gear consists of assorted hand tooled leather cases and sterling silver hand engraved brushes in a variety of shapes, sizes, and designs. To clear the mind and focus concentration I have made a portable rock balancing kit. Before painting I will balance a small rock upon another rock. The concentration needed to do this focuses the mind and clears it of distractions. It also concentrates sensitivity into the hands and fingers. Once the rock is balanced one is prepared mentally and physically. The hand is now ready to pick up the brush. The painter becomes nothing - painting becomes everything. My “Brand” is a cross over the letter M. The cross I use is not a Christian cross but a children’s or “artist” cross. As a painter I have always related to the suffering, (living a life of rejection and forced solitude) the death, (self-inflected as a result of this rejection) and the resurrection, (his paintings are now among the most valuable paintings in the world) of Vincent Van Gogh. 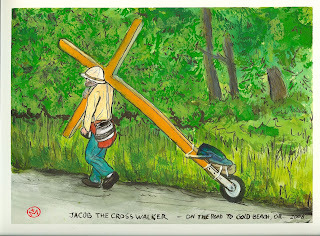 For me, as an artist, - because of his religious dedication to art, - the life of solitude, suffering, and death of Vincent Van Gogh, is analogous to the suffering and death of Jesus Christ on the cross at Calvary, - metaphorically speaking of course. Thomas Merton and I are “men of the cross” but there is an entirely different belief and motivation behind our dedication to the cross symbol. Thomas Merton followed the Jesus Christian cross because he believed Jesus was the true son of God. I follow the Van Gogh artist cross because I believe Van Gogh was a manifestation of a true artist. I have adapted the symbol of the cross over the letter M as my personal “artist signature.” I have been signing my paintings with that symbol for over thirty years. To me it represents the child-like innocence of art and the serious religious-like dedication needed to be an artist. 5. Religion, the Cross, and Me. When I started this blog I had a vision of posting my day by day experiences. I thought I would be talking about the area, my paintings, and reflecting on Thomas Merton the artist. 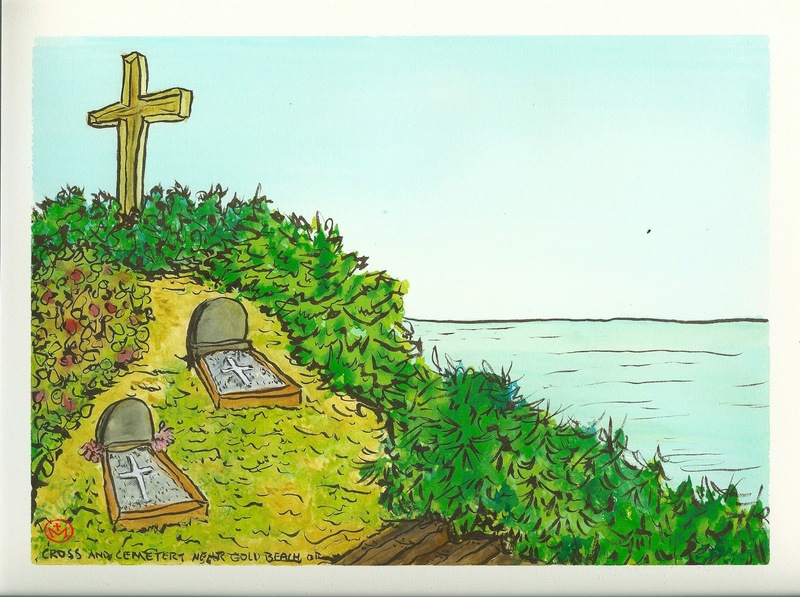 I thought I had made my point on religion and the cross at the beginning of this blog and that there was nothing left to say on the subject. I was wrong. The drive into the monastery was itself a religious experience. Talking to Sister Kathy was also like a religious experience. 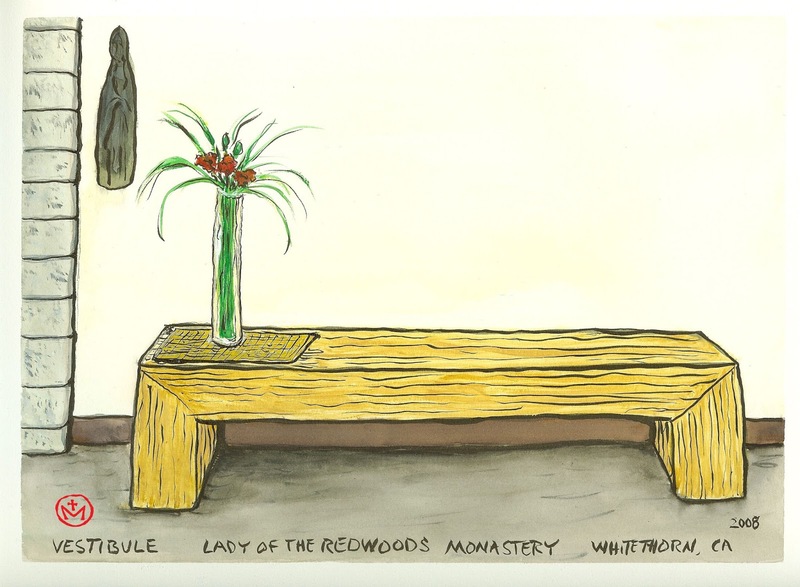 She was so kind, so gentle, so open and friendly it made me ashamed of how stereotypical shadowy, secretive, harsh, mean, and unpleasant I had assumed religious women in monasteries were. I had been wrong and was somehow elated by the fact that things were quite the opposite of what I had thought them to be. After leaving the monastery in a good mood I became upset when I found that I could not get to the area where Thomas Merton took his photographs. I was upset that I couldn’t paint as I had planned. But my disappointment didn’t last long. For some reason, as I walked the bluff overlooking Needle Rock, I felt calm and accepted that it was meant to be as it was. The object of my trip now shifted from painting to religion. It kept going through my mind, why am I thinking in terms of a religious experience? Why are things not the way I thought them to be? Why can’t I get the entire monastery experience out of my mind? Why am I not upset that I am not painting? The next day as we traveled up the coast to Oregon my mind kept returning to the monastery and all that I had experienced. 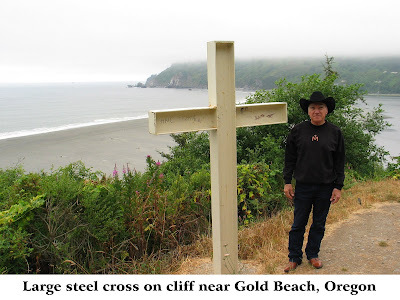 Then, while we were driving on a road above the ocean, as we turned a corner, this huge steel cross appears. What was this big cross doing out here on a cliff in the middle of nowhere? Why is it here? Why am I here? Of course there are logical reasons for both questions. 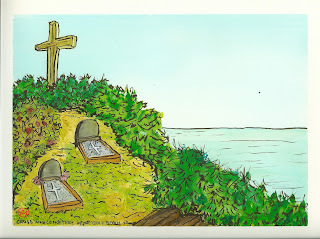 The cross was there because down the side of the cliff, out of sight, was a small Indian cemetery. 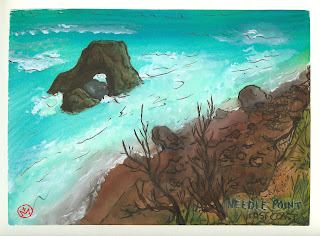 I was there because I was unable to paint at Needle Rock. But still, in the frame of mind that I was in, I couldn’t help thinking that somehow there was a message here for me. As we drove further up the coast I had just about convinced myself that I was being foolish and that I was over thinking everything and that I should forget about the monastery, religion, the cross and all the rest and get back to thinking about painting. Then something truly astounding happened. 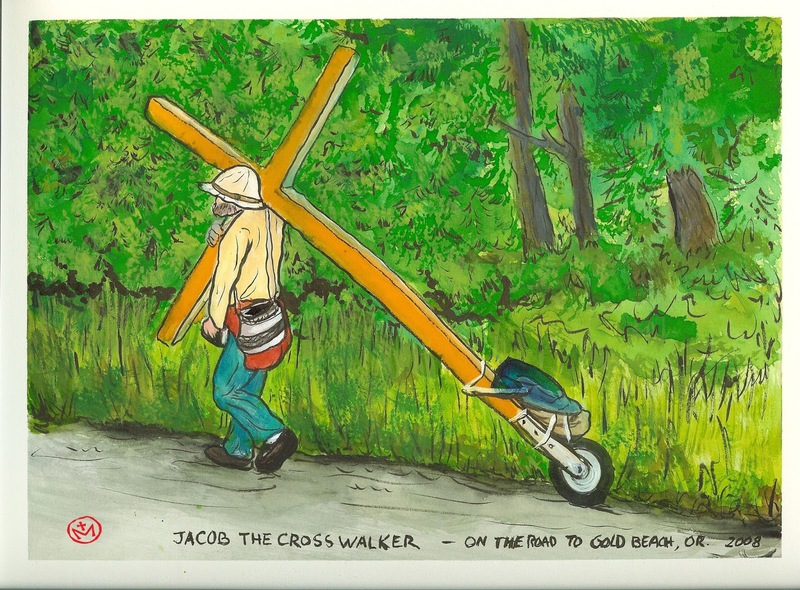 I crossed the road, caught up with him and said, “Do you mind if I walk with you a bit?” He replied, “ Not at all, please, be at peace and join me.” I couldn’t believe I was doing this. His name was Jacob and he was the most gentle, soft spoken young man I have ever met. As we walked he talked continuously. He talked about Jesus, and said he was where Jesus had lead him and he was doing what he thought Jesus wanted him to be doing. He didn’t preach to me, he didn’t try to convert me, he just talked about how happy he was to be doing what Jesus wanted him to be doing. After about an eighth of a mile I said I had to go back. He stopped. I shook his hand and wished him well on his journey. He said, “Thank you brother for walking with me.” I went back to the car to an astounded Alice. She asked me what possessed me to walk with him because I am usually critical of religious people who flaunt their religion. I said I didn’t know why, I just felt compelled to walk with him and that I was glad I did. We stayed awhile at the turnout while Doug took some photos. 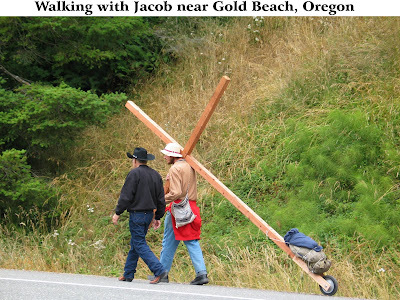 When we returned to the highway and drove toward Gold Beach the cross carrier was nowhere to be found. I watched for him the next day but he was gone. If Alice hadn’t taken a photo of me walking with him I would be ready to believe this never happened, that it was all in my imagination. But it really happened and I have a photo and two witnesses to prove it. After that, for the rest of our trip I didn’t even try to paint. I brought my paints along as we took the Mail Boat tour up the Rouge river but I never even took them out of my carrying case. I don’t know what this was all about or what it all means for me as a painter, if anything. I’m not trying to interpret all this I’m just telling you what happened and how I responded. I don’t know if my response was just because of a buildup of religious thinking as a result of my Cattle Brand Project or if there is something changing in my approach to art and painting. I just don‘t know. But make no mistake about it, in spite of it all I am still a non-believer and there is no way I will become a Thomas Merton Christian. But I will have to admit that there are still things I don’t understand about religion, the cross, and me. 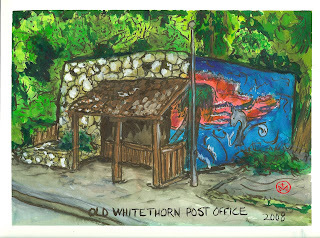 Whitethorn sits on a mountain road leading to the small coastal town of Shelter Cove. Most of the small towns in the redwood area are quaint little towns with maybe one home-style café, a gas station and a general store. 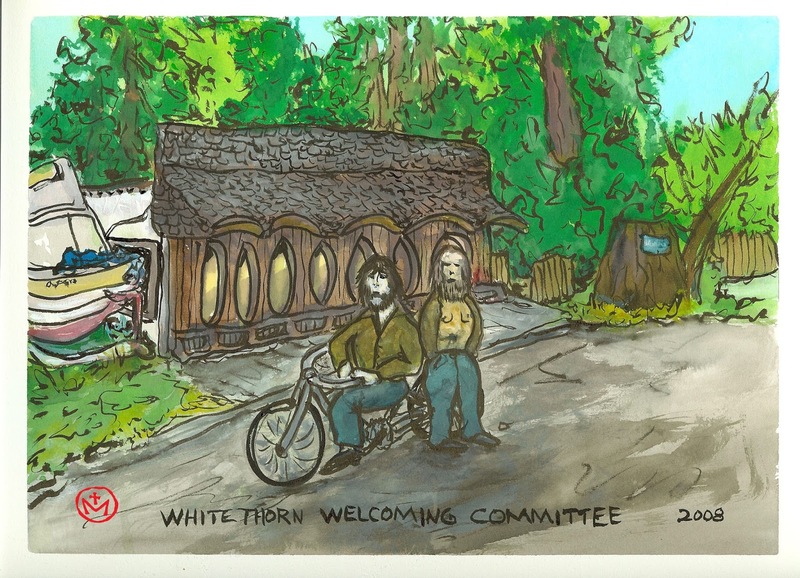 I assumed Whitethorn was similar with perhaps a curio shop selling redwood religious items because of the Redwood Monastery down the road. 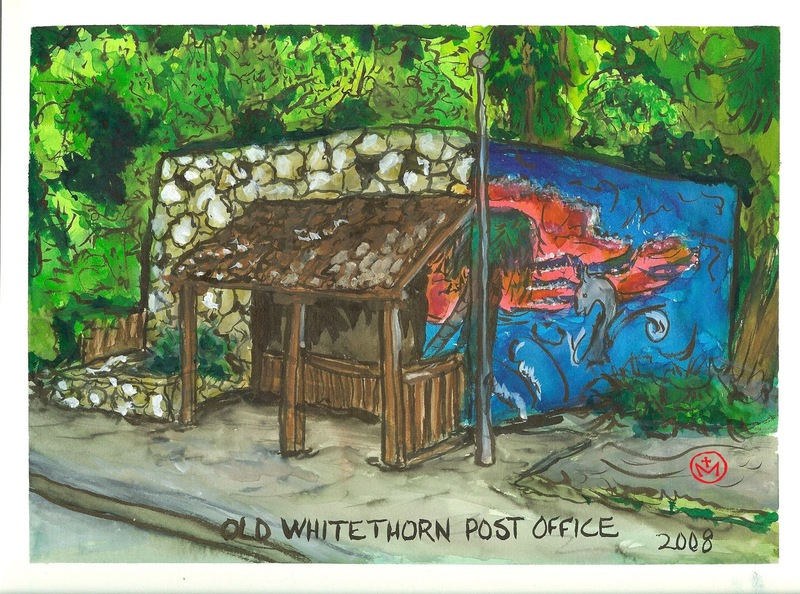 I was hoping to mail some MailArt envelopes from the Whitethorn Post Office. 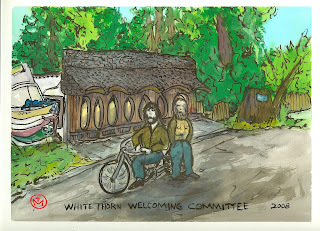 Above is a photo of main street Whitethorn. The old post office is the building on the right with the mural on it. 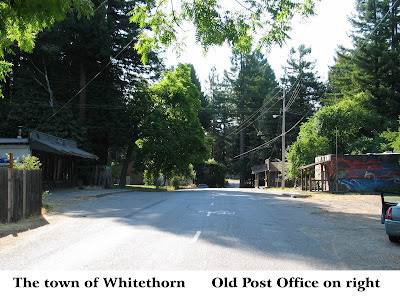 (a new post office is on the main road to Shelter Cove) Needless to say the town of Whitethorn was not what I had expected. 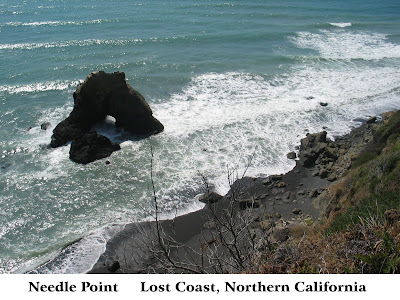 Thomas Merton took his photos on the lost coast about halfway between Needle Rock and Bear Harbor. He talked about seeing trucks and people fishing so I assumed I would be able to drive to the exact spot and from there walk the beach looking for the places where he took his photos. 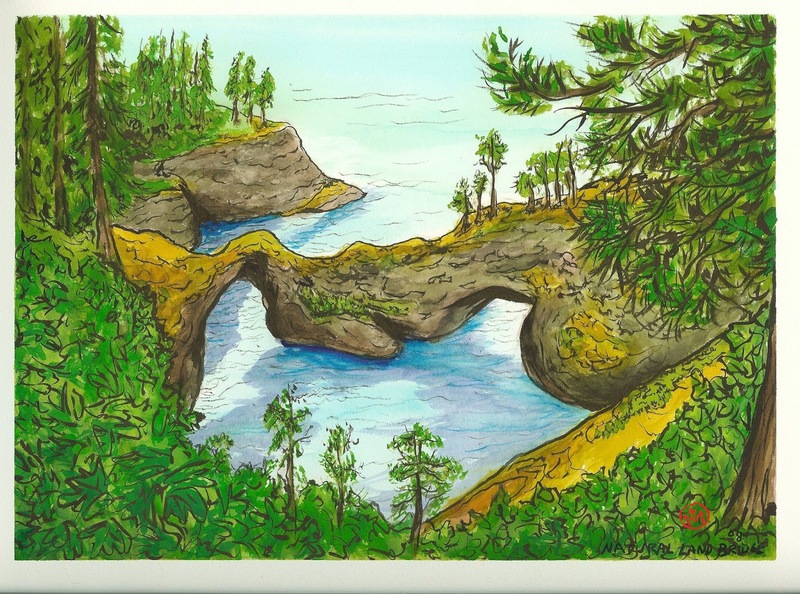 I could then paint the same scene in the exact spot. 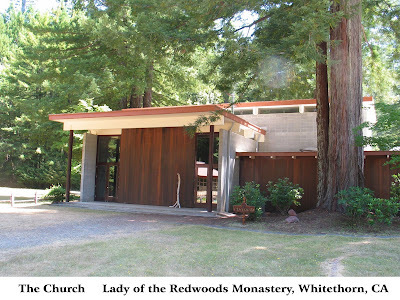 When I had told a Sister at the monastery of my intentions she said that the area where Thomas Merton took his photos was very difficult to get to. She said it was a 13 mile, steep one lane dirt road with deep ruts and no turnouts. She recommended we not go. But I was determined, so went anyway. We made it to a small ranger cabin that sat on the bluff near Needle Rock. The road beyond that to the beach area was only accessible by four wheel drive vehicles. We spent the rest of the afternoon taking photos. 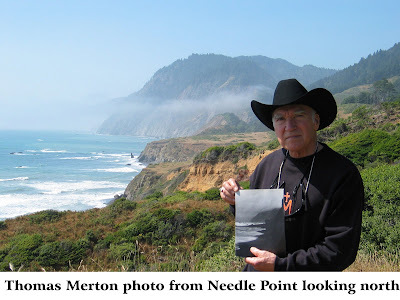 I only found one place where the shoreline matched one of Thomas Merton’s photos. But from the bluff it was not the same angle. My painting plans were dashed. 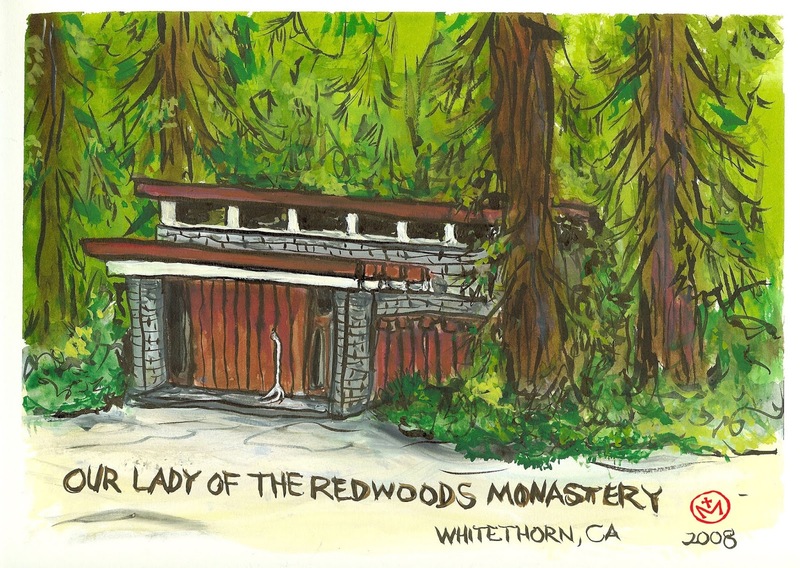 When I read that Thomas Merton stayed at the Our Lady of the Redwoods monastery while he was photographing the nearby coast I tried to envision just what that monastery might look like. 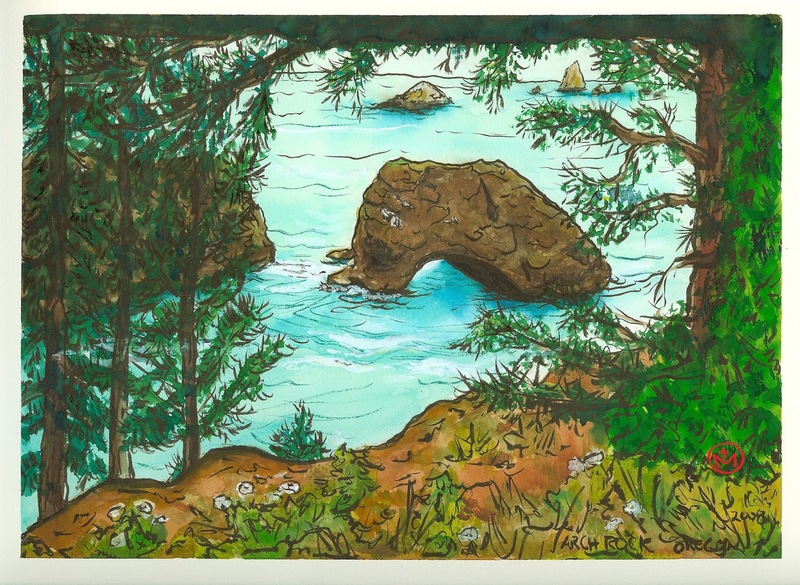 What came to mind was a dark stone building tucked away in a redwood grove, with a tall ivy covered stone wall and wrought iron gate blocking the road. I pictured an eerie place with strange rituals, dark secrets hidden behind creaky doors, and unspeakable things hiding in trunks in basement dungeons. Because Lady of the Redwoods monastery is a community of women Cistercian monastics I had visions of old women dressed in black habits peeking out of iron barred windows, - pulling back into the darkness when they saw me looking. 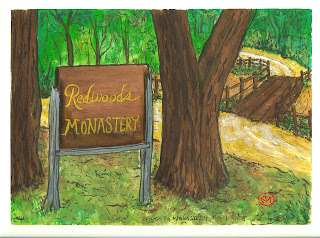 We crossed a wooden bridge and drove slowly down the road to the monastery. We came to a clearing that had two motel-like buildings, with maybe ten units each, about five hundred yards from the road. 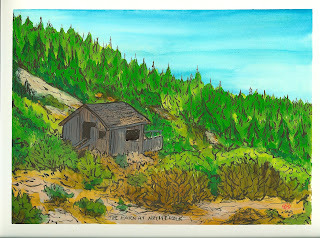 Continuing down the road, beyond a small stand of trees, we could see another clearing with several wooden buildings. As we approached we saw a casually dressed elderly woman walking across the grounds toward a Japanese-style wood building. She smiled and walked over to our car and said, “ Hello, would you like to visit our church?” I said yes, we would love to. The church was a modern building made of cinder block with lots of glass, exposed beams and a flat roof. It had a very “fifties-modern” look. Attached was a complex of buildings of similar style. Suddenly another Sister appeared. She was younger, had a beautiful smile, soft voice and a peaceful, serene presence. When I told her of my interest in Thomas Merton she immediately began to tell me some antidotes about his stay at the monastery. She showed us a painting that he had donated to the church. She also showed us a signed black and white photo of himself that he had sent. She gave us a tour of the church and some of the other buildings then left us. We spent some time taking photos while absorbing the peaceful atmosphere. 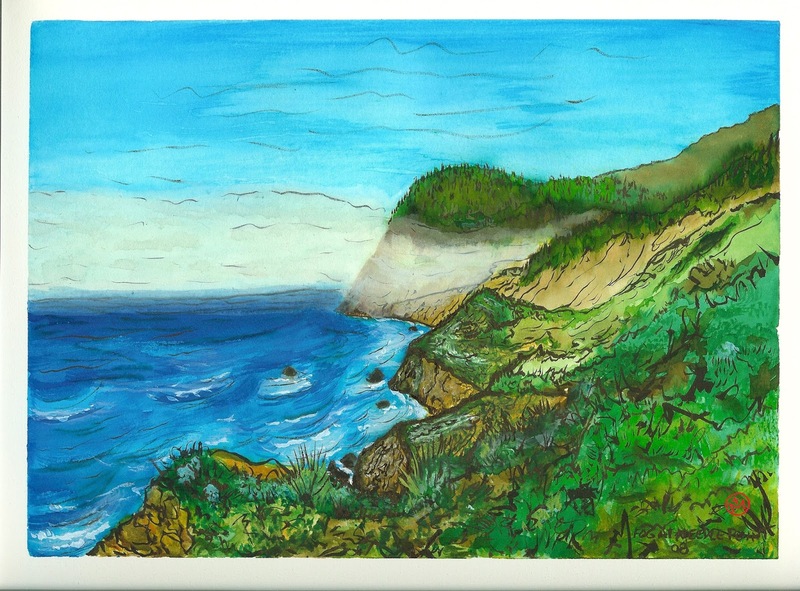 After I returned home I began working on some paintings of our trip. I worked from memory and photos.